Pre ty is the Managing Trustee and Chairperson of ACWF. She has a delightful 11-year-old daughter- Prarthana, who was diagnosed with Global Development Delay(GDD), a condition characterized by slow mental and physical development. Simple everyday tasks like eating, drinking, walking, talking, etc take years to develop in a child with GDD. Prety’s little girl started to walk with support at 8 years of age. She is yet to develop any kind of speech. And yet, this little girl is all smiles, in spite of her disability. She has a 5-year-old sister, and they get along just fine. In spite of Prarthana’s extremely diminished capability to participate in games that her 5-year-old sister can enjoy, the siblings manage to come up with scores of opportunities to have fun together. Prety has no qualms about bringing up her Special Child. She simply gives it her 100%, unmoved by the outcome. She claims that children with Special Needs are the world’s greatest teachers. They teach you to be patient, compassionate, loving and happy….with an emphasis on Happy! 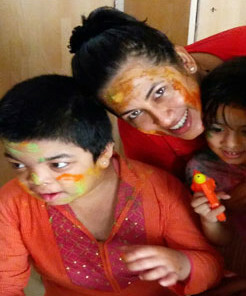 An MBA in Marketing, and a writer by profession, Prety currently volunteers as a research writer and parent councillor with various Special schools in Mumbai.